Salem, OR—Governor Kate Brown today addressed the 33rd Annual Skanner Foundation Martin Luther King Jr. Breakfast. Governor Brown's remarks celebrated the civil rights leader's legacy of expanding voter access and called for further expansion of Oregon's groundbreaking automatic voter registration program. "On my desk, so I see it every day, I keep a rock engraved with some words from Dr. King: 'Our lives begin to end when we are silent about the things that matter.' As your former Secretary of State and as your Governor, I take this statement literally. 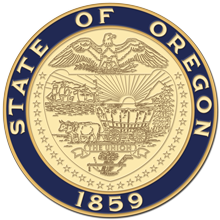 It is vital to ensure every Oregonian has access to the ballot and their voice is heard. Dr. King knew that voter access would lead us to a better world. One with more equity, integrity, and fairness." READ GOVERNOR BROWN'S FULL REMARKS HERE.